I love my BlackBerry Playbook! Like many other Android developers (and especially those using Shiva), I jumped at the chance of a free BlackBerry Play Book. RIM offered one of these to anyone who released an app on the BlackBerry App World store during February. And Shiva makes it really easy to create Play Book executables – it supports direct export from its Authoring Tool. There were some compatibility issues with the Play Book Simulator, so like other Shiva developers I ended up ‘flying blind’ and submitting Mars Defender without ever actually knowing how well it would run. But apart from a couple of small tweaks, it worked straight up. Figuring out the process of signing the app. was the most time consuming step. About 10 days later I received my Play Book. Not only had RIM paid the shipping cost, they actually made sure to pay the Irish import tax too (liable since it was coming from outside the EU, probably about €60) – this was a nice surprise that I wasn’t expecting. It’s a really nice device – I love the size, coming in at halfway between an iPad and a smartphone. So it’s not small and fiddly nor is it too unwieldly to carry around for everyday use. Nice bright screen, punchy front-facing speakers. Touch sensitive strips above and below the visible display provide OS-level controls in a similar way to the hardware keys on Android devices (this is something that’s seriously lacking on iOS devices). I have been testing out Afterburn 2150, one of my in-development games on it, and it’s giving between 100 and 150 frames per second – versus my laptop which gives between 40 and 65! Now admittedly my laptop (soon to be replaced) isn’t exactly the sharpest tool in the shed, but still I expected it to outstrip a tablet device with ease. The lack of Play Book apps on the App World store is a bit surprising – there are literally only about 30 games in the ‘Space’ section, for example. And the store is somewhat swamped currently by low-quality games like tic-tac-toe, presumably written by people looking for a quick way to a free Play Book. The downloads of Mars Defender are relatively good, currently over 40 in less than a month (which is about the same as what it gets on the Android market), but I wonder how much room there is for serious success on the current install base? Probably not much, but then again the device itself is good so there’s every chance things could change in the future or with a Play Book 2. It’s a games controller for iOS devices. At first I assumed it was for Android, since my games have been getting much better visibility on the Android market. But no, iOS only for the moment. They offered to send me one of these if I’d agree to integrate it into Mars Defender. It actually makes very good sense to play with a proper hardware controller, since touchscreen ‘virtual joysticks’, as used by many games, are really pretty poor in terms of usability and ergonomics. Plus your fingers on the screen are taking up valuable real estate. The Sony Ericsson SDK seems to be rushed and ill-thought out, forcing a game structure that would work for some games and not for others (certainly not for me, using Shiva). They did refer me to a ‘developer’ at the time, but he really didn’t seem to know what he was doing. (At least I never claimed to be a Java/Android expert). By comparison, 60beat integration turned out to be really straightforward. Apart from a little trouble before upgrading to XCode 4.2, getting their SDK integrated and working was easy, and worked first time as promised. It actually makes a great improvement to Mars Defender – it’s easier to control the spaceship, and far less tiring on your fingers. 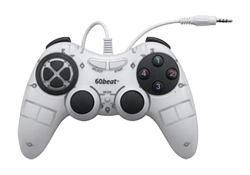 The 60beat plugs in via the headphone/microphone shared port, and communicates with the device via sound. Quite clever; and not a big problem since iOS devices have bi-directional audio ports so you can still hear the game by using the supplied splitter and headphones. Forcing the player to use headphones can only be a good thing, as the deep bassy rumbles in the Mars Defender soundtrack are completely lost on the weak built-in speakers. Mars Defender with 60beat support went live on the app store yesterday. No sign of any major increase in downloads, unfortunately, but I guess 60beat doesn’t yet have much coverage. I hope this works out for them, it’s a great piece of kit. 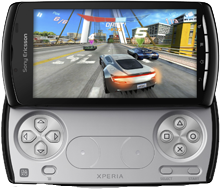 To be fair to the Xperia Play, I am still using it as my main phone due to its excellent audio quality.